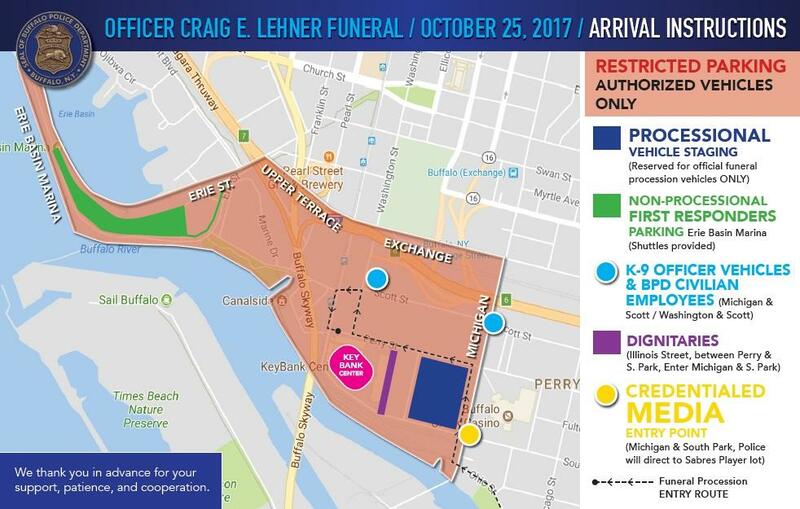 The colored section of this downtown Buffalo map shows where traffic will be closed to the general public beginning at 6 a.m. Wednesday, for purposes of staging and parking related to Officer Craig Lehner's Funeral. 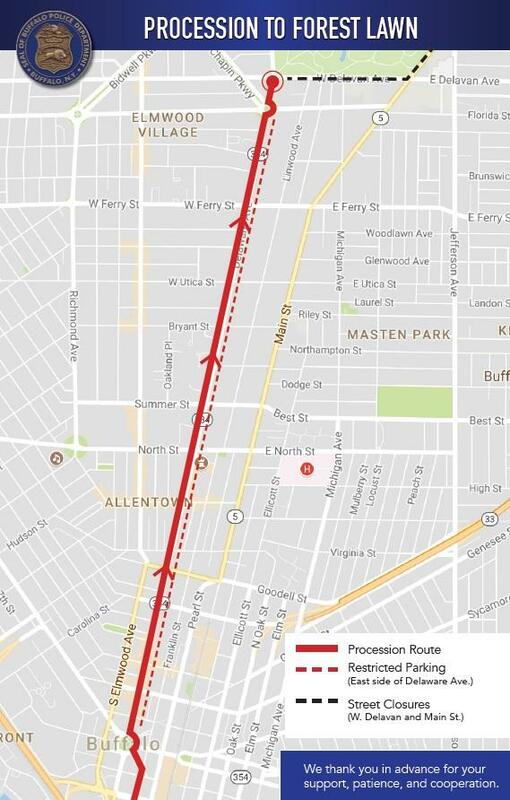 This map shows the first stage of the procession route from KeyBank Center, where Buffalo Police Officer Craig Lehner's funeral will take place, to Forest Lawn Cemetery. 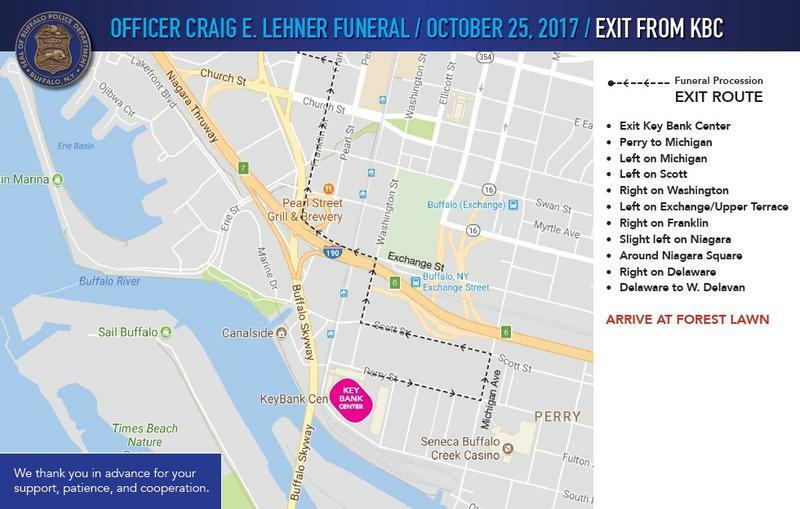 A continuation of Officer Craig Lehner's funeral procession from KeyBank Center, through Niagara Square and then north on Delaware Avenue to Forest Lawn Cemetery. The map highlights road closures around the cemetery during the burial. 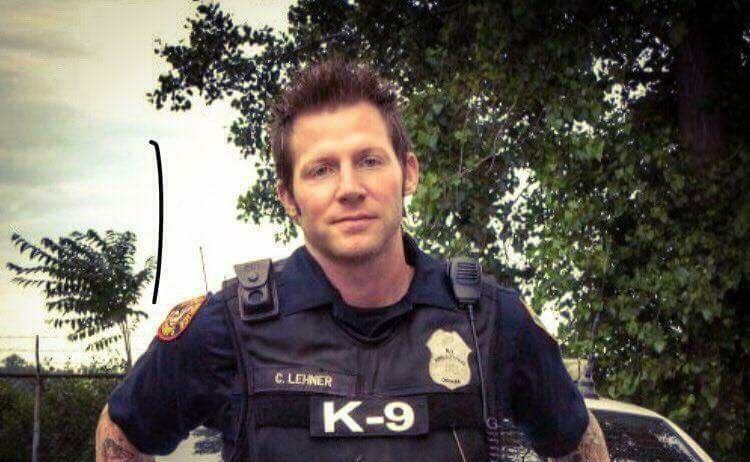 Since Lehner was first reported missing during a police diver training exercise on October 13, the Buffalo Police Department has received overwhelming support from other police and first responder agencies and the general public. 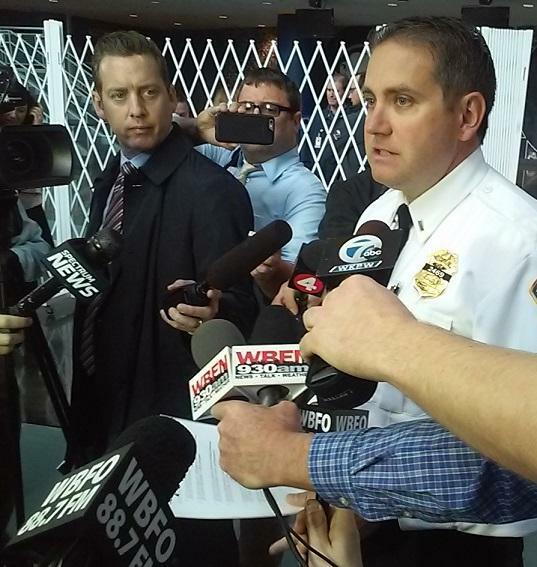 As final plans were being put into place for Wednesday's funeral inside KeyBank Center, Police Lieutenant Jeff Rinaldo once again expressed the department's gratitude for the public's response. "We're getting phone calls, our union's getting phone calls, each police's district's getting phone calls," Lt. Rinaldo said. "On our social media, on our Facebook page, we're getting messages. Everybody's just trying to reach out and offer any assistance and, again, our heartfelt 'thank you' goes out for that. We couldn't do what we need to do without the help of everybody in this community." Tributes will extend far beyond downtown Buffalo Wednesday. 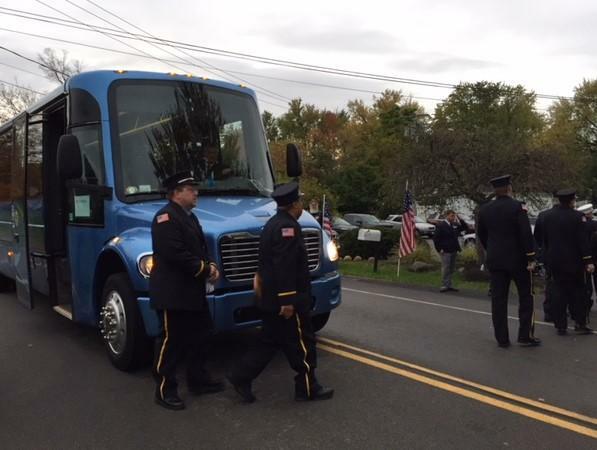 Governor Andrew Cuomo has ordered flags at all state government buildings to be lowered to half-staff. The Peace Bridge will be illuminated blue on Wednesday evening and, from dusk until 11 p.m., Niagara Falls will be colored in blue light for 15 minutes at the top of every hour. Those are just the latest gestures and showings of blue in memory of Lehner. City Hall and other downtown Buffalo buildings have already been illuminated in that color. So, too, have countless homes. Additionally, fundraisers to support the Lehner family have ranged from t-shirt sales to the distribution of blue-painted pumpkins. Direct donations to the Lehner family may be made in care of the Buffalo Police Benevolent Association at 74 Franklin Street in downtown Buffalo. 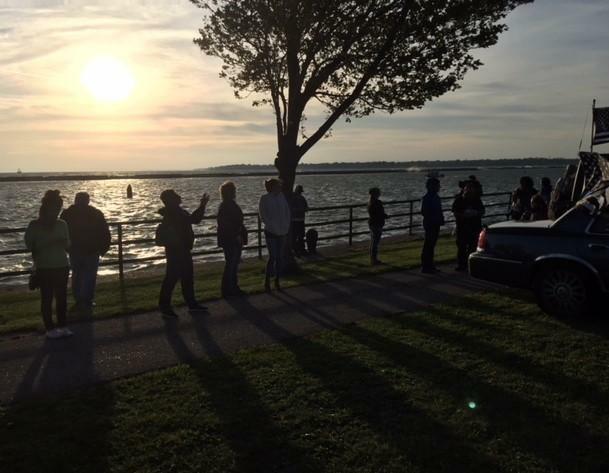 Police and other searchers spent five days looking carefully in the Niagara River for Lehner. Questions were raised about when the investigation may begin in earnest. Rinaldo said it's already underway but it will step up after Lehner's colleagues have had a chance to say goodbye. "Obviously, at this point our [Underwater Recovery Team] is doing what they need to do," he said. "I would expect that starting next week, the meat and potatoes of those investigations will start rolling into a larger role."